Armitage Shanks HTM64 LBG L Portman 21 hospital pattern wash basin. 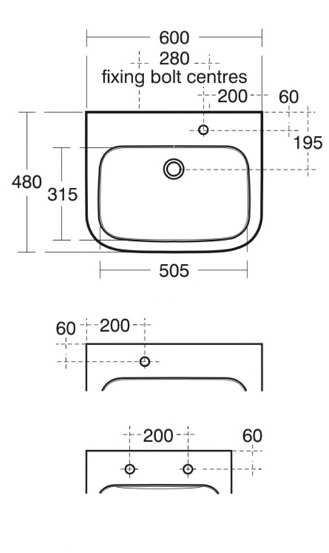 Large hospital wash basin 600mm wide. Manufactured in white vitreous china. Conforms to regulations for small basins for washing hands under running water associated with personal washing (not clinical procedures). 32mm flush grated waste fitting, or 32mm waste with plug chain and chain stay. One right hand, one central, or two tap holes, with no overflow, and no chain stay hole. Complete with wall fixings for solid walls or wood / block walls. Contour 21 lever thermostatic HTM64 tap shown for illustration purposes, but can be ordered in the options. Please note our price includes the wall fixings and waste fitting that are expensive and not included in most online prices. Right, central, or two tap holes. Plastic 32mm resealing bottle trap. Chrome plated 32mm resealing bottle trap. Intatec thermostatic lever mixer tap. Armitage Shanks HTM64 TMV3 Contour 21 lever operated thermostatic mixer tap with copper tails.